The doctors with black cloths around their mouths, took out a silent rally, calling a state-wide indefinite strike. The doctors called off their duties, except emergency services, pressing for their demands of hike in stipend and for the issuance of registration certificates, soon after the completion of their course. They are demanding registration of their degrees immediately after completion of their MBBS or PG course as per the norms of Medical Council of India (MCI). "We are fighting for our genuine rights. We demand an immediate registration after MBBS. After MBBS, the state administration is giving us photo-copy of our registration which is not valid. That paper is not being considered for any kind of jobs. They are asking for original papers, which are not provided to us," said Anusha, a junior doctor. She further claimed that their stipend for the year 2016 and 2017 has not been cleared yet. Earlier on Thursday, the doctors sat on strike in King George Hospital (KGH). 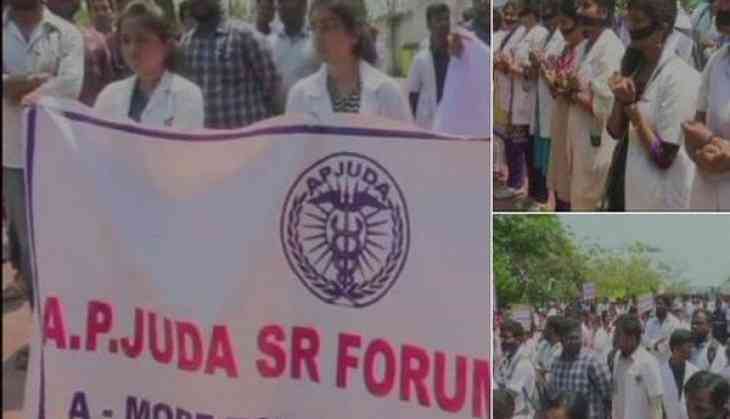 The APJUDA members in Visakhapatnam earlier said that the state health minister agreed to fulfill all the demands made by the junior doctors within two days, but did not keep up to their promise. "After the health minister's assurance, the APJUDA state committee decided to suspend the strike temporarily for two days. But the government didn't stand on their promises. If all the demands are not fulfilled by the government, then we will call off the emergency services too," he said.